There are certain moments on this journey that have had the ability to take my breath away. It still feels like a surreal concept to believe that there is a baby inside my bump, and while interesting to see a scan of what Alfie looks like, it is difficult to really bond with the little fella. Well it was until last week when quite by chance, he did something so incredibly sweet that it made me fall head over heels in love with him: he got his first case of hiccoughs! They only lasted about 10 minutes, most of which was spent furiously scrabbling around on the web to find out what the chuffing hell was happening, but more than any single other moment in this pregnancy, it will be the one I cherish the most as the first real connection I felt with him. I think Keith had a similar moment a few days ago when for the first time he actually felt Alfie kick. I know it’s a bit late on, but there has been a combination of impatient husband and stubborn baby to blame for that one. Alfie’s usual trick is to wait until Keith has fallen asleep and is snoring gently with his hand still on my bump before putting on his show, which obviously I find endlessly amusing, and Keith does not. I think it was fair to say that Keith was VERY excited by finally feeling his son move and is now looking forward to October with a new found enthusiasm. He even threw the term 'skin-to-skin-contact' into a conversation the other day, entirely of his own volition. After I had asked him who he was and what he had done with my husband, he admitted that he might have been reading some of the books I have left lying about in strategic places. I have to admit I was hugely impressed!! I’ve been meaning to write something about this for a while, but have put it off because quite frankly, I’ve never been one to justify myself to other people. It seems a convenient and appropriate time to set down my thoughts now though. The most important thing to explain first, I think, is the fact that Keith and I set out on this journey to become parents very much on our own terms. What was most important to me, and fully supported by Keith, was the idea that we wanted to make the process of becoming parents a positive experience. We wanted to write our own story, and for it to be the sort of birth story you read and think the person was clearly on crack because there is no way anyone can think so positively about their birth. That’s not to say either of us is foolish enough to think it would be easy, or painless but hard work and pain aren’t always the worse things that can happen to a person. It became obvious within about a millisecond of looking into birth options that a hospital birth was just not going to fit any of the desires we had for the birth of our child, and home birthing seemed to become a much more natural fit for what we felt was important. The more I read, the more I liked what I was hearing, and it made me think seriously about what my feeling s were about birth. My first thought is that I truly believe that birth doesn’t need to be treated as a medical event. In fact, the evidence I have read and heard leads me ever more down the path that says medical births leave women scarred, both physically and mentally. This was something that was borne out pretty strongly by the fact that almost as soon as Keith and I let slip we were trying to have a baby, and even more so when I actually fell pregnant, women seemed to delight in telling me their birth horror stories. I know that us women use talking as a way to process our emotions and thoughts, so I was always grateful to be allowed to share those experiences with the people telling them, but I found it profoundly sad that not one person came to me and said, “You know what? It was hard, and it hurt, but the whole thing was such an empowering experience”. I don’t use the word empowering lightly, because it is a word I feel has been massively overused and become a bit of a cliché. I think it holds true in this case though, because the sense I got from each of the birth stories I was told, was that the women involved had been stripped of the control that was rightfully theirs and been subjected (another word I don’t use lightly) to what is now commonly referred to as a ‘cascade of intervention’ by the people caring for them. It doesn’t require a lot of digging in this modern age of the internet to learn how we got to the position where women are routinely taken into hospital and asked to labour in a semi reclined position. The first part is simple: after WWII, housing was in an appalling state, and with the advent of the NHS, a lot of work was done to encourage women out of their “dirty, run down” housing and into “shiny and clean” hospitals, where the chances of them delivering safely were much higher. I can understand that desire, it fulfilled a need at the time, but that reasoning has become lost in the mists of time. What we are left with, in an age with the best standard of housing this country has ever seen, is that women are still educated to believe that hospital is the only “safe” place to give birth. The second ‘given’ of the post war birth is the idea of giving birth semi reclined. If you do a search of the web on woodcut and midwife, you will see a lot of images of women sitting on various styles of birthing stool throughout the centuries. So why in modern times have we moved away from that idea and towards the idea of lying on a bed? Does this come from a new medical insight into the way the human body works? Nope, the exact opposite in fact. Short of standing on your head, lying semi reclined is possibly the worst position you could choose to give birth. The reason this position has become the standard approach, is this ... ready? ... ease of access for your midwife/ doctor. Well sign me up for that one then!! There is now a veritable smorgasbord of innovative ways to counteract any issues a woman might face from birthing in this position - from drugs to forceps to episiotomies – which to my possibly naive mind, seems a little like that poor bloke who went onto Dragon’s Den with an amazing invention to stop car oil glugging out of the spout when you are trying to top up the engine. If you didn’t see it I will summarise it thusly: He got ripped a new one by the dragons. Not because his idea wasn’t well made and executed but because he had created a solution to a problem that doesn’t exist!! If you want to stop an oil container glugging and covering your lovely engine with amber coloured nastiness you have only to do one simple thing: turn the can on its side. In the same way, I would suggest, us women should have a think about how our bodies are designed and why; perhaps then we might not need all these miracle cures for the ill that doesn't exist. I want 2 midwives all to myself. I want to help nature along by staying mobile in the early stages of my labour. I want to be able to move around in familiar surroundings. I want to be able to eat and drink from my own kitchen when the need strikes, not have Keith running down the corridor to vending machines or being told I’m not “allowed”. I want to wallow in a birth pool in a room with low, calming lighting. I want to fall asleep afterwards with my husband and my newborn in our own bed. None of these things were going to be possible if I went into a hospital to give birth. On a more practical level, there is one last overriding reason which says to me I should stay away from hospital to give birth – hospitals are for sick people, and I’m not sick!! And in current times, when we are told that swine flu is going to cut vast swathes across our population by the time I’m due to give birth, I count that as just one more reason to avoid a place where sick people congregate for the relative sanctuary of my own home. I know there are a lot of “what if” questions that people often use to scare or dissuade crackpots like me from wanting to try something as crazy as giving birth outside the confines of a nice safe hospital, and while I don’t intend to debate any of them here, I will give you the only answer I am able: we’ll take it as it comes. I've been holding off making this post because my hormones have finally caught up with me this week and I have been a bit of a mess, crying at pretty much anything and everything, which has not helped my levels of hydration in this weather!! One of the things most likely to make me cry at the moment is the thought that our little boy is now in his 24th week. And before you raise an eyebrow, and nail a slightly worried look on your face, please remember, 24 weeks is considered the week of viability. In other words, should Alfie decide to come now, or any time hence, he has a very good chance of living. Of course I'm not planning on giving birth just yet, but it is a real "smack-you-in-the-chops" moment when you realise that from here on in (God willing) you are actually going to be a parent. I have even started being able to visualise the labour and birth now, which I have never really been able to do before. I suppose that has been helped by the fact that I took delivery of my birth pool this week!! I am more than slightly excited about this fact, and only just managed to resist the urge to unpack it on the spot. Keith was also uncommonly excited about the arrival of the pool, until he admitted his real interest lay in "borrowing" the pool to take down to Bill's house to use as a paddling pool in the back garden. Luckily for him I'm too hot to express any extremes of emotion at the moment (except crying) and he got away with a raised eyebrow and a head shake. The most important thing I have to do with this post however, is to introduce you to Alfie's best gift so far. This is Little Boy Blue. 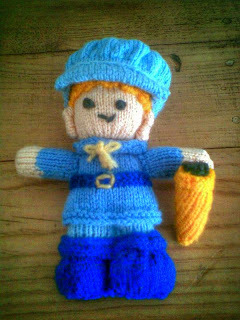 The reason he is the most treasured toy in the shop is because he was knitted for us by my baby sister Mich, who did the most amazing job, especially considering she has never so much as picked up a pair of knitting needles before now!!! What she doesn't realise is that she has now signed herself up for knitting duty for the next 20 years, because what the point of having a child if you can't cackle with amusement on Christmas morning when they open some kaleidoscopic horror from a relative? Anyone with any especially eye watering jumper patterns, please feel free to send them over!! !